“Today” helps the user to master his/hers life. The present day, date, time and all appointmensts that apply today. Carers enter agreements via an Internet calendar by using a PC, a tablet or a smartphone – anytime, anywhere. Remember things that have happened and knowing what the future holds, is comforting for a person who does not remember too well. In the calendar view, you can check future tasks and take a look at what has already happpened. Photos of the family, friends, celebrations, favorite radio channels, newspaper or weather forecast for a desired location, creates joy and satisfaction. Carers submit pictures, select radio channels, newspapers and what the user is interested in. This is done on the carers own website – via the internet. Two touches on the screen sends a text message or e-mail to selected individuals with notice of contact needs. The carers then takes contact with the user. The recipient(s) of the contact message must be given at the carers Memas Website. Need for a high contrast, or simply a matter taste? Memas can be displayed in four colors on the tablet: White, black, yellow og blue. This can be controlled easily from the carers website. The functional ability or and the interest of the user can change over time. One can choose which functions should be displayed to the user. 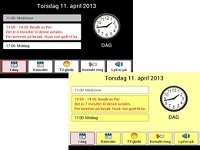 The simplest version only shows which day, date or time it is, as well as current activities. This is easily controlled from the carers website.